Gens, A.; Sánchez, M.; Vállejan, B. The behaviour of swelling clays is better understood if the effect of the pore size structure on their hydromechanical behaviour is taken into account. In compacted (and therefore unsaturated) swelling clays, the pore size structure is set up during compaction but it may change significantly in response to various actions such as loading and hydration. Although the distribution of pore sizes is of course continuous, useful insights can be obtained by considered only two structural levels: microstructural and macrostructural as well as their interactions. This dual material aspect is reinforced when the material is composed of a mixture of powder and highly compacted pellets. This mixture is an attractive sealing material in radioactive waste disposal schemes because, even when only modest compaction efforts are applied, a sufficiently high density value is achieved after hydration has taken place. However, the heterogeneity of the material gives rise to a complex hydromechanical behaviour that must be well understood if a sufficient degree of confidence in the performance of the seal is to be achieved. The hydromechanical behaviour of this material has been modelled using a double porosity formulation together with a generalised plasticity constitutive law that takes into account the two structural levels. Appropriate interaction functions define the relationship between the strains occurring at the two levels considered. An important feature of the formulation is that hydraulic equilibrium between the two porosity levels is not automatically assumed. The formulation and constitutive law are applied, via coupled numerical analysis, to the simulation a series of long-term constant-volume hydration tests performed at the CEA (France) and CIEMAT (Spain) laboratories. It is shown that it is possible to reproduce satisfactorily the complex swelling pressure development for specimens that span a range of dry densities and sample lengths. Finally, the implications for the behaviour of this material in full-scale seals are briefly discussed. The paper presents a double structure constitutive model based on a generalized plasticity formalism. The behaviour of macrostructure, microstructure and their interactions are described. A coupled hydromechanical formulation is then presented that assumes no hydraulic equilibrium between structural levels. Constitutive law and formulation are applied to the simulation of the behaviour during hydration of a heterogeneous mixture of bentonite powder and bentonite pellets. A satisfactory reproduction of observed behaviour is achieved. 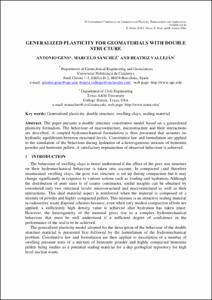 Gens, A.; Sánchez, M.; Valleján, B. Generalized plasticity for geomaterials with double structure. A: International Conference on Computational Plasticity. "Computational plasticity XI: fundamentals and applications: proceedings of the XI International Conference on Computational Plasticity held in Barcelona, Spain, 07-09 September 2011". Barcelona: Centro Internacional de Métodos Numéricos en Ingeniería (CIMNE), 2011, p. 1-10.